Untreated teak furniture, left outdoors, turned to a silvery-gray color. 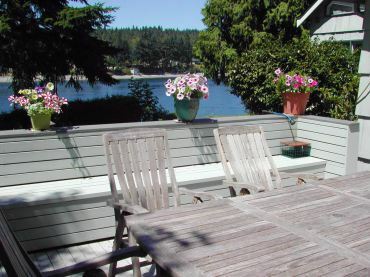 It is best to leave outdoor teak tables, chairs and benches unfinished and sanded to weather to a beautiful silvery-grey color (as shown in this photo). But if your indoor teak furniture, especially a table top, has been exposed to sunlight for several years, it probably has a rougher feel due to the grain being raised by the exposure. The original, rich honey-brown color may have bleached out to a blotchy blond look. At this point, you should wet-sand the surface with very fine sandpaper — somewhere in the 200- to 300-grit range. 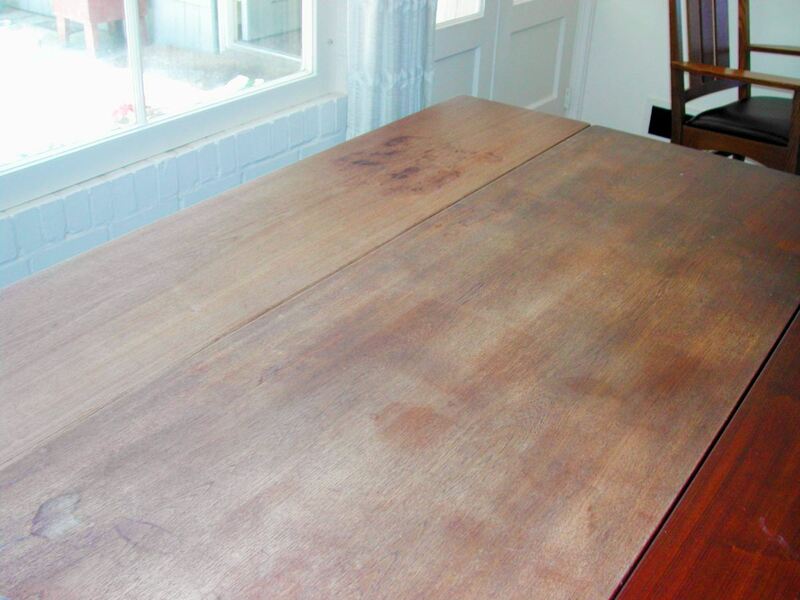 The drop-leaf table before being restored. 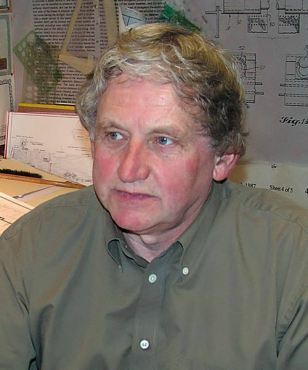 The type of sandpaper is not critical. It can be standard paper, usually tan or brown, or wet-or-dry (waterproof) type that frequently is black or another dark color. Do not use steel wool. Fine bits of metal will remain in open grain woods such as teak or oak and if left in a damp room or outdoors, the tiny metal bits will rust and show up as dark spots. 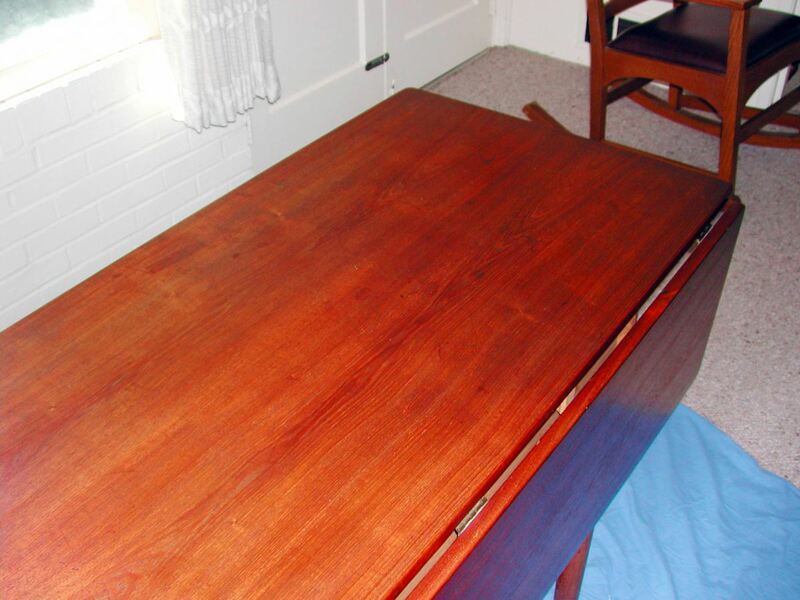 It took about an hour of light sanding, oiling and wiping off with a cloth to get the table back to its color. Be sure to sand in the direction of the grain. Just pour some oil, such as Scan-Care Teak Oil, on the table top (maybe two or three tablespoons), and sand an area that your hands can easily reach. Do not wipe it off at this point. The final result — the customer was pleased. Move to another section and repeat the process. Oil should stay on the table for at least 15 minutes, but probably not longer than a half hour. Check the surface with your hands. If the oil is beginning to thicken and feel gummy, it’s time to wipe it off. Use a clean, dry terrycloth such as a white washcloth, and wipe off the oil. Refold the cloth and dry again. Repeat this until all the oil is gone. When using cloth, it is not important to wipe in the direction of the grain. In fact, you will get better results by wiping in a circular motion. According to Wikipedia, oilcloth (such as the printed picnic or dinette table covers of the 1960s era and before) was created by basically saturating linen cloth with linseed oil and letting it dry. 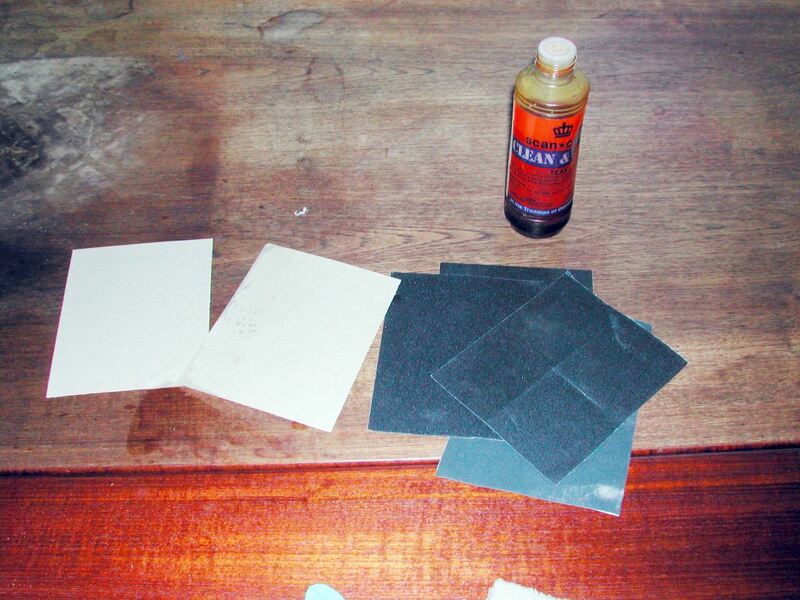 All you need for restoring the teak: sanding paper, oil and a cloth. After you have wiped off the oil, make sure the surface is just slightly damp — almost dry to the touch. If you leave oil on the surface it can dry to a rubbery film. 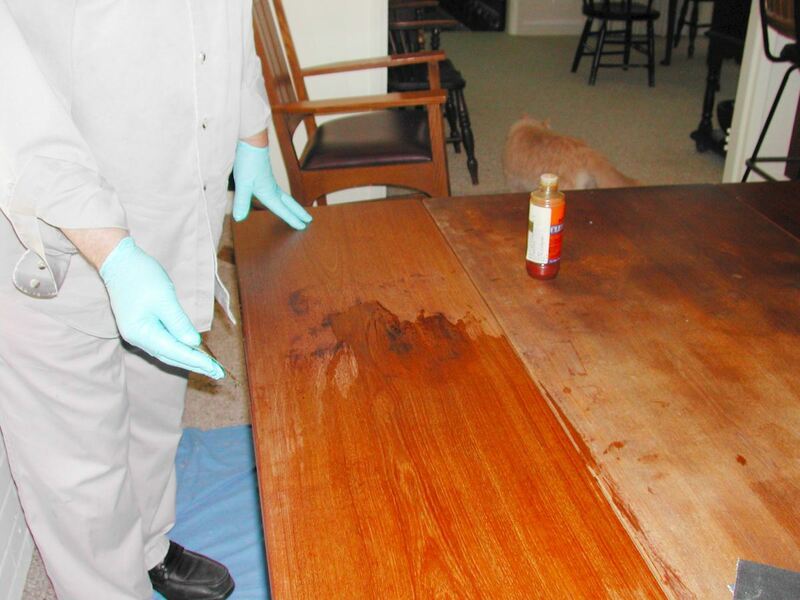 The proper way is to leave the oil to dry solid in the open grain of the wood and not on the surface. If, after 24 hours, the surface still appears drier than you’d like, apply an additional coat or two according to the above procedure using only cloth, wiping off any excess between coats and allowing 24 hours between applications. Additional sanding is not necessary.